CR.42 LW has detailed engine and cockpit, flame dampened exhausts and partially spatted undercarriage. Decals for 2 aircraft: 'E8+FK' Nactschlachtgruppe 9, Turin, April 1944; 'E8+AH' Nactschlachtgruppe 9,Fabrica di Roma, March 1944. 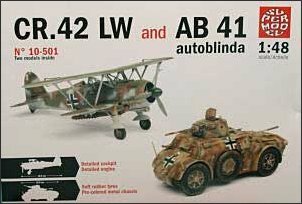 AB 41 Autoblinda features metal chassis, detailed hull exterior, turret with gun breech detail, rubber tires and separately molded hatches. Also includes separately molded jerry cans and on-vehicle tools. 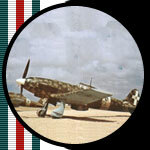 Decals and painting reference for 4 vehicles: Polizia Africana, Tunisia, 1943; Regio Esercito, Libya, 1942; Wermacht, 162nd Infantry Division, Italy, July 1944; Regio Esercito, 15th rgt. Cavalleggeri di Lodi (R.E.CO. ), Pinerolo, Italy, 1942. 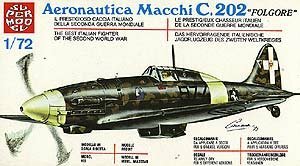 Little needs to be said about this great plane; so much has been written about it now that it certainly qualifies as a WWII Classic aircraft and is certainly one the best aircraft manufactured by the Italian aircraft industry in WWII. 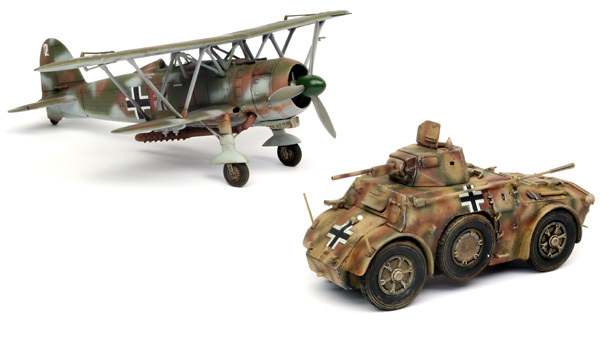 This is an excellent kit, with up to five different configurations to model including 20mm underwing canon pods, underchin radiator and many more options.